Since President Donald Trump’s comments in Brussels during the recent NATO summit, the merits of the Atlantic alliance have been up for debate in public discussion—a nice change of pace, considering the normal establishment consensus emanating from Washington D.C. on America’s decades-old system of treaties. President Trump’s follow-up interview with FOX News’ Tucker Carlson brought concerted focus on the nation of Montenegro which was admitted to NATO last year. 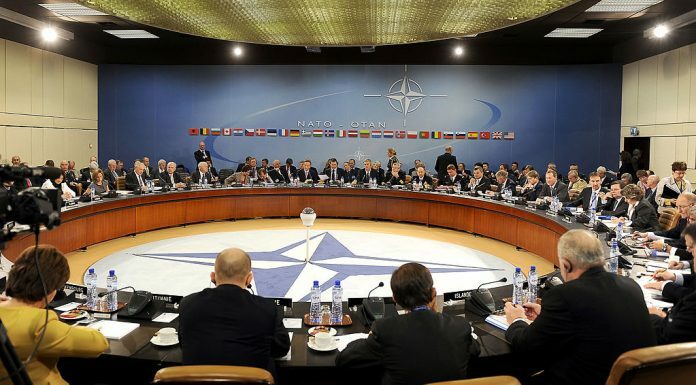 Pillars of beltway media opinion, both left and right, have gone into high gear defending the continued utility of NATO and why its post-Cold War expansion has been necessary. A friend, who agrees with that opinion, sent me a National Review article, “Tiny, Faraway Countries and Us,” written by Senior Editor Jay Nordlinger. The article argues in favor of collective security through NATO and uses the 1930s as its primary example. Nordlinger first seeks to establish that not only is Montenegro worth defending, it already needs defending. This is due to accusations of Russian interference and even a failed coup attempt, a narrative that seems far from coherent. He then launches into comparisons between Trump’s sentiments and those of British Prime Minister Neville Chamberlain. Chamberlain described the Czech crisis as “a quarrel in a faraway country between people of whom we know nothing.” This was an opinion shared by the British public at the time. An opinion likewise shared in France. Nordlinger reminds us of the question that was being asked by Frenchmen in 1939: “Why die for Danzig?” Danzig was an over 90% German city that was separated from Germany in the Treaty of Versailles and turned into an autonomous city-state. Separated from the “Fatherland” by the Polish Corridor, it was a longtime goal of German interwar foreign policy to see the city returned to German sovereignty. Nordlinger answers the nearly eighty-year-old question. “Why die for Danzig? In a year, Frenchmen were dying for Paris.” This far leap rests on the common assumption that German invasion was inevitable and unstoppable, so the best thing to do was to start the fight then and there. This assumption has been continually challenged by those who think Nazi ambitions existed in Eastern Europe only, and that the Reich’s leadership had no interest in a wider war with the West. This argument has been laid out thoroughly in both popular and academic histories. And it’s important to remember: France lost the war in 1940 and was militarily occupied. Going to war with Germany in 1939-40 cannot be said to have been in the French national interest or beneficial to the French people. Inspired by Polish official Radek Sikorski, Nordlinger lays out his idea of deterrence. If multiple countries ally together for mutual defense, they can make a strong enough front to prevent aggression from outside powers and lower the risk of war. “After two world wars, the wise heads who founded NATO decided that collective security was the best defense — the best way of preventing further war.” These are mindboggling examples to use to defend “collective security.” In 1914 Europe was divided between two military alliances, the Central Powers and the Entente. The great empires assured each other of support in war, and all this did was lay a tripwire that eventually exploded. Far from preventing conflict, the system of alliances ensured that an incident between two countries in the Balkans spread war across multiple continents. Likewise, in Spring 1939 Prime Minister Chamberlain gave the British war guarantee to Poland. This did not prevent the September 1st invasion by Germany. It only obligated France and Britain to declare war on Germany, leading to the former’s occupation and the latter to rely on the English Channel for protection from the same fate. Collective security did not stop Hitler’s invasion, but put the Western powers in a war they clearly were not prepared to fight. The world wars, far from showing the necessity of collective security, show how it can go wrong. Fast-forwarding to the present, we are reminded that East European countries like Poland and Estonia have sent soldiers who have “fought and died in Afghanistan.” Sending marginal padding to one of America’s colonial wars (in Estonia’s case, 163 soldiers as of 2011) benefits neither the American people or Poles & Estonians. Nordlinger admits that Estonia would have no chance of victory in a metaphorical war with Russia. Which pushes the most important question to the forefront: when should the American people fight for a country that is not their own? Only the most hardline of pacifists would say the United States should not defend its own borders and territorial integrity if invaded. In the same vein, only the most hairbrained promoters of American hegemony would say that the United States needs to vouch for the collective security of every country and fight to defend the current world’s borders in perpetuity. There is a middle ground. American leaders knew throughout the Cold War that Eastern Europe did not fall within the U.S. national interest. In 1956 when Soviet tanks invaded Hungary, in 1968 when they crushed the Prague Spring, and in the 1980s when they suppressed Solidarity in Poland, America stood by and did not intervene. That is because Eisenhower, Johnson, Reagan and those in between realized that while it was important to the people of Bozeman, Montana and St. Augustine, Florida to stop the Soviet Army from ever crossing the Elbe River, American lives were not worth sacrificing beyond that point. That was all when the Soviet Union and the Warsaw Pact posed a reasonable threat to Western Europe. Since communism’s fall in 1991, American taxpayers ought to question why they’re still writing checks for foreign militaries. Quoting one of his earlier articles, Nordlinger says “If NATO crumbles, that will have big effects elsewhere. U.S. guarantees will be seen as worthless. Japan and South Korea will be resigned to China. And so on.” A full U.S. exit from NATO doesn’t have to mean the alliance “crumbles”—it merely means Europeans will have to defend Europeans. And the idea that all U.S. guarantees must exist forever, otherwise they have no value, is ridiculous. The United States has guaranteed the defense of Western Europe for seventy years, including three decades where the original threat hasn’t existed. That’s more than enough to prove American commitment. And if Japan and South Korea, the third and eleventh largest economies in the world respectively, must carry more of their own weight, is that apocalyptic? Nordlinger ends with a point I agree with—NATO should not be an assumed positive but should be argued. He says this is necessary “as memories of past crises fade.” In fact, it’s necessary as past crises are misremembered.